Corfu (Greek: Κέρκυρα - Kérkyra) is a ceety an a umwhile municipality on the island o Corfu, Ionie Islands, Greece. Syne the 2011 local govrenment reform, it is pairt o the municipality Corfu, o which it is a municipal unit. It is the caipital o the island an o the Corfu regional unit. The ceety serves as a caipital for the region o the Ionian Islands an aw. The ceety (pop. 28,185 in 2001) is a major tourist attraction, an haes played an important role syne the 8t century. The ceety haes become kent as a Kastropolis (Castle Ceety) acause o its twa castles. In 2007, the auld town o the ceety wis inscribed on the UNESCO Warld Heritage Leet. 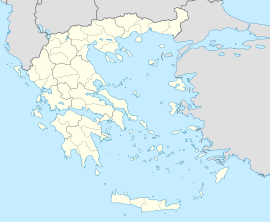 The Municipality o Corfu (Kérkyra) generally stretches in a northwasterly direction frae the ceety on the central east coast o the island, an haes a land aurie o 41.905 km2 (16.180 sq mi) an a total population o 39,487 inhabitants. Besides the ceety o Corfu/Kérkyra, its lairgest ither touns are Kanáli (pop. 3,556), Potamós (2,365), Kontokáli (1,616), Alepoú (1,606), an Gouviá (952). The ceety o Corfu haes a lang tradition in the fine airts. The Philharmonic Society of Corfu is pairt o that tradition. ↑ "Home Page". Municipality of Corfu. Retrieved 2010-03-23. ↑ 7.00 7.01 7.02 7.03 7.04 7.05 7.06 7.07 7.08 7.09 7.10 7.11 7.12 7.13 7.14 "AllCorfu.Com: Corfu's Twin Cities". allcorfu.com. Retrieved 25 February 2010. ↑ "Twinned Cities". Municipality of Corfu. www.corfu.gr. 2005-09-20. Archived frae the oreeginal on April 9, 2005. Retrieved 2007-03-30. ↑ "Bratimljenje Beograda i Krfa". B92. Retrieved 2010-02-25. Wikimedia Commons haes media relatit tae Corfu town.